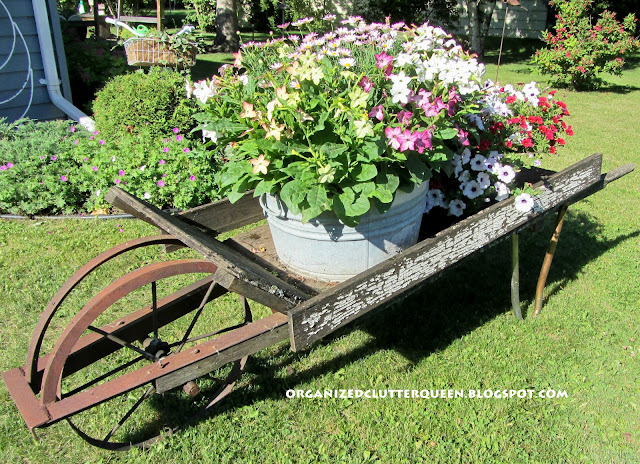 Way back last February, when I was just dreaming about flower gardening, I posted about "My Favorite Outdoor Collectible", my wheelbarrow. I also want to mention that the white, metal round object leaning against the house in the background was part of a vintage hay rake. It was welded together at the tips to make a piece of yard art! I got it from my sister's old farm, also ten plus years ago. It was brown, and I painted it white. Also a favorite collectible! I used to buy red nicotiana for the larger galvanized tub, but now I can only buy mixed 6 packs. 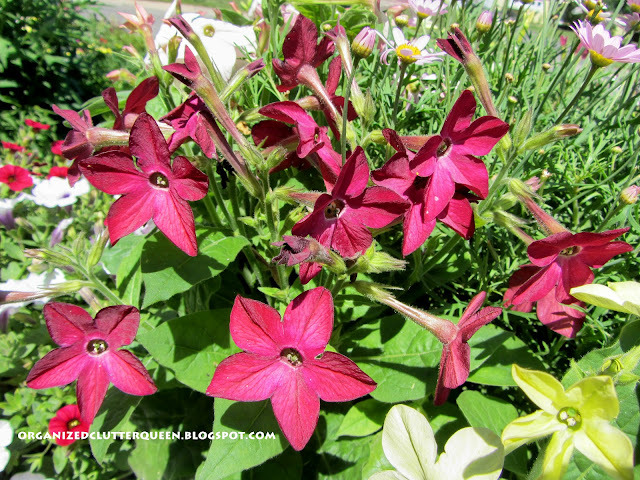 They weren't blooming when I bought them, and as you will see only one spot turned out red in the back of the tub. The center of the larger tub is pink African daisies. The smaller tub has a mix of petunias and million bells. I am thankful that somehow the cutworm caterpillars missed these pots! Isn't this wheelbarrow a beauty? A $15 garage sale bargain from 10 plus years ago! My favorite outdoor collectible for 2012! It is wonderful. I went back and looked at the different color schemes...but can any of them be bad in such a fantastic cart??? Oh yeah! That's a beauty alright! 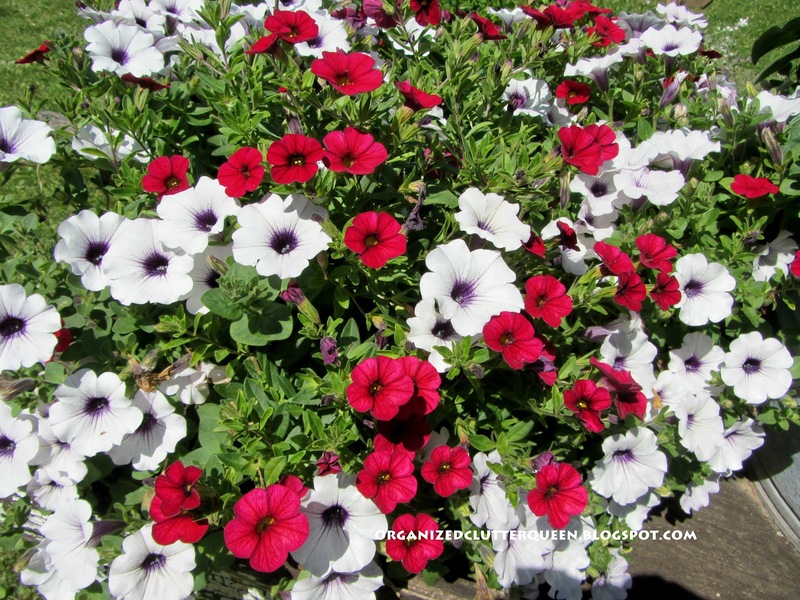 I've had African daisies before and love them...I had white with a gorgeous purple center almost like your petunias. I've never heard of million bells but that's a stunning red flower. Looking good in the neighborhood! Beautiful! 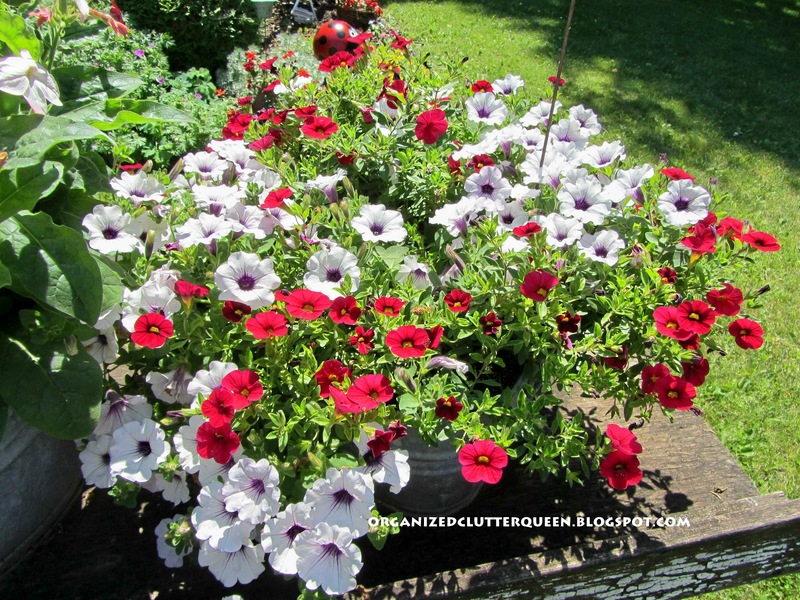 I love your wheelbarrow (what a steal) and the flowers are gorgeous too. Oh Carlene! 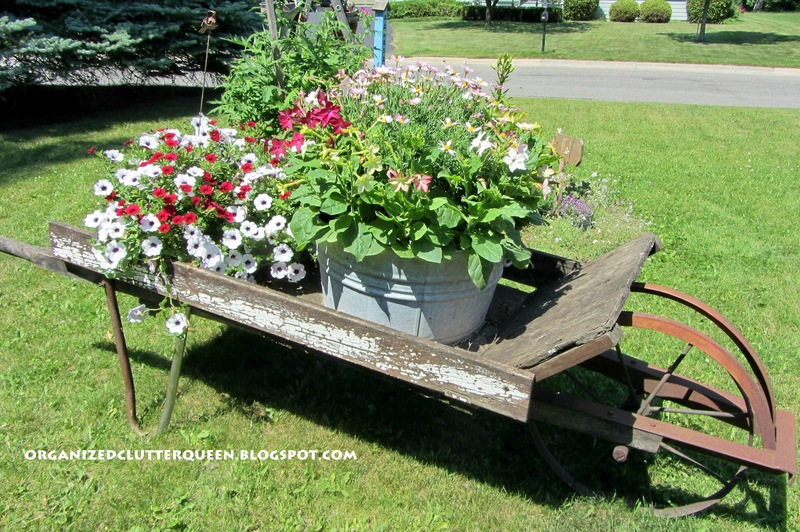 No matter what flowers you use, that wheelbarrow are going to make them all look good!! 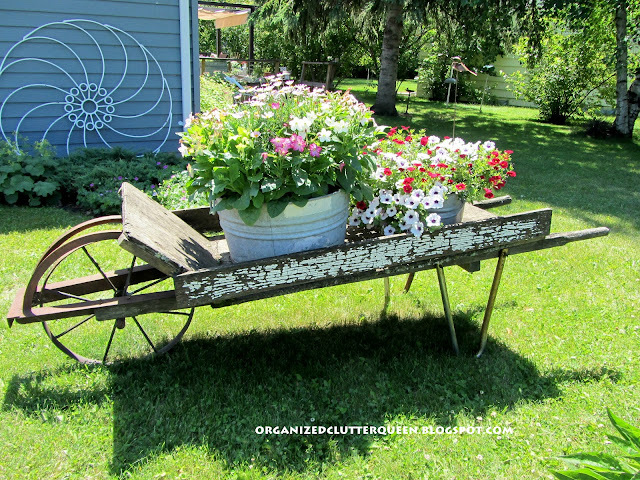 I adore that little wheelbarrow. It makes me think of my grandparents farm. And the flowers just make it 10x better! Your wheelbarrow is fabulous! I'm glad you told us what the circular piece was- I never would have guessed. And your flowers are looking gorgeous! You're Kidding? $15???!!! Love it!!! 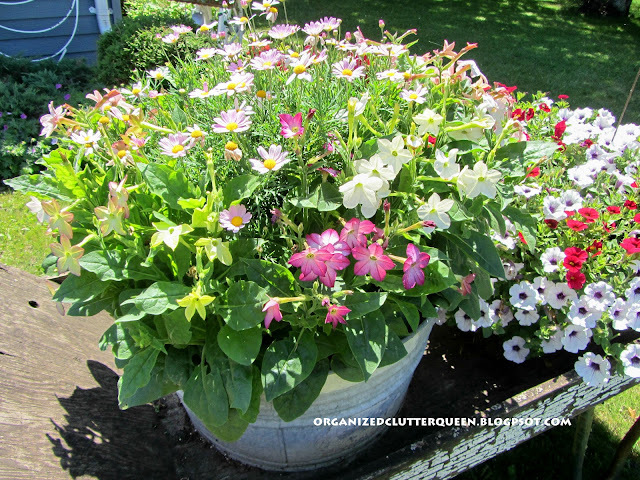 Your flowers look so lovely in the galvanized tubs! Thank you so much for linking this up to Rustic Restorations Weekend!!! What a cute lawn addition. You have a nice bunch of flowers too! And what a bargain. 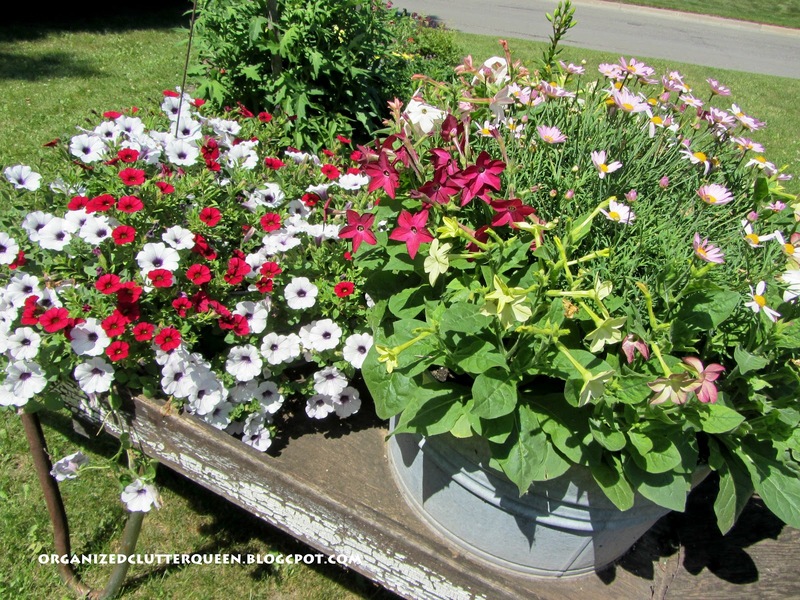 That tub your flowers are in would cost as much as you paid for the wheelbarrow. I love your flowers and wheelbarrow. Now that is one of the most charming things I have ever seen! Love it and I love the tub inside of it!! Love your wheelbarrow and all the gorgeous plants, your white rake art piece is fab too. I love your wheelbarrow! It's the perfect stage for all of your beautiful flowers. Love that wheelbarrow and the rake. You've got me looking at all things differently now with the yard possibilities :) Oh yeah, the flowers are beautiful too.